Day 1: The Trooper by Nixon. Allow me to be blunt, those looking for a pair of £50 on-ear headphone might be advised to look elsewhere. Look at “The Trooper” (awful name). For a set of headphones they’re undeniably pretty, with their bold clean lines, flowing design and big robust looking cups that fold under the headband for easy transport. 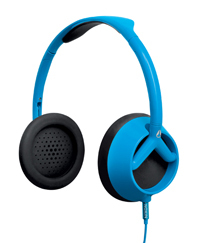 They come sporting a volume knob on one side and a detachable 3.5mm audio cable. There are some nice flashes of thoughtful intelligent design here. That’s what makes these phones such a let down — because once you’ve stopped ogling them and actually tried listening to them, the experience ceases to be any fun whatsoever. The Trooper(s) don’t feel on the imminent brink of self-destruction but neither do they feel sturdy. The plastic they’ve been moulded out of looks pretty but up close it’s cheap and feels brittle. The bundled lead 3.5mm headphone lead is pretty flimsy too, though it is wisely detachable. The cups are comfy but the soft rubber they’re made out of also does a fine job in stymying the phones’ sound. Once removed their sound improved markedly. I won’t even attempt to sugar the pill. The sound quality is absolutely abysmal. You’d feel cheated if you’d spent £10 let alone £50 on these abominations. The on-box guide suggests that The Trooper(s) are best suited to metal, hip-hop and rock, though why their makers, Nixon, would think so is frankly beyond me. I’ve heard more bass coming out of a boiled egg. The mids are overwhelming yet muffled and the treble is all but entirely drowned out. And it’s such a pity because it sounds like there is almost something half-decent going on in them. I was so convinced this was the case that I removed the soft rubber phones and replaced them with more conventional ones to provide more of gap between the speaker and the ear. And it helped. But only a bit. I fiddled the EQ on my iPhone, tried them with my stereo, tried them with computer, tried them with my digital radio, but they all sounded awful. The Trooper’s sound isolation is pretty good, they managed to keep out some of the most pervasive decibels on the 29 bus. Unfortunately that’s not a blessing because I’d rather be listening to paint dry. I know it doesn’t make sense… What can I say? I’m angry. Overall: 8/20 — and that is generous. Despite all the nice design touches and lovely case, The Trooper(s) are a real let down, and not worth any where near £50. Here are all the colours you can get them in anyway.